Cloud servers and VPS providers have gotten cheap enough for just about anyone to own their own server. Whether you need cloud services for personal PC backup, a webserver, or just to play multiplayer minecraft, the price has finally reached the point where it is trivial to run a server for just about any reason. Which one of these would you rather use? The interface is clean, the tech is solid, the stability is unmatched, and above all else, Rackspace has a commitment to open-source technology. Rackspace's cloud systems are built off of OpenStack, an open-source project that can be used to build public and private cloud systems. From servers, to files, to backups, Rackspace's OpenStack implementation have you covered, in an easy-to-use, easy-to-understand way. One of the things that stuck out when trying out Rackspace over Amazon Web Services is the documentation. Amazon does have documentation, but it is presented in a very Amazon-y way, as a loose collection of links, super-dense information, and a Microsoft Help file lookalike interface. Not exactly the easiest thing to use. Rackspace, on the other hand, has a much better design and layout for their documentation. Parsing through the Knowledge Center, most of the articles read like they were written for people, not as a technical document. They contain use-cases, examples, and are generally easier to parse than their AWS counterparts. The documentation can get highly technical, if that's what you're searching for, but for the most part, the top-level of results are going to be easily digestible chunks of information. This is a good thing. From the way this documentation is laid out, I can get a general overview of an OpenStack concept, then drill down to the GUI way of doing things, technical information, command line syntax, and API calls for various languages. With Rackspace, I don't have to be a technical guru to run a cloud server, but if I want to launch cloud servers via my Ruby on Rails application, I can do that. Rackspace is very committed to the open-source community, putting a ton of code on their GitHub page, and accepting pull-requests from the community. Its little things like this that add up to a great experience. If something is broken in their open-source code and you can fix it, go for it, send a pull request, they'll merge it in. Working with OpenStack and their open cloud api has been a joy. I've tried their Rackspace Private Cloud, and it is simply awesome. An easy-to-install Linux distribution that comes with a full OpenStack implementation. 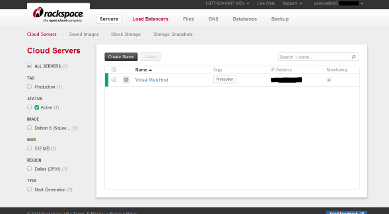 I can run cloud servers on my home network, using a great interface, all for free. Yes, all for free. Try it out today. It is a very powerful distribution, and gives you the opportunity to build a complete private cloud without needing to commit to support, or contracts, or lock-in, or anything you don't want to. They do offer support plans, but you aren't forced into any of these. 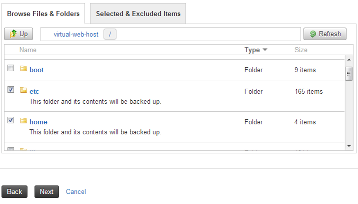 Backups can be configured to grab certain folders or files, so you don't have to take a full image each time you back up. Backups are stored via Rackspace Cloud Files, and billed as such, so its very cheap to keep your system backed up. You can store backups for 60, 30, or an infinite number of days. This is a godsend for anyone creating a business on Rackspace services. Speaking of Cloud Files, those are decently easy as well. You will need a program like Cyberduck or Fireuploader to efficiently upload files, and I'm really not sure why that is. With drag-and-drop uploading supported in all major browsers, why can't we upload a pack of files? I'm sure there's a technical reason for the decision. You can also make files publicly available on the web via Akamai, all with a simple click. This is very beneficial for people who need to distribute large files quickly. Honestly, Cloud Files is a great service, but it really is the weakest of Rackspace's lineup. This could be due to the general ecosystem around their Cloud Files API, it may be that people just haven't built very many user-facing applications on it, but the way Cyberduck and Fireuploader handle directories is very strange and completely incompatible with each other. I originally had a public application uploaded with Fireuploader, then tried to make some changes in Windows via Cyberduck, and I couldn't navigate directories. This is most likely a problem with Fireuploader and not Rackspace itself, but it still made things more difficult than they needed to be. I'll still use the product, but it could be better. Sure, the tech is all well and good, but anyone can write good code, anyone can make a service like this. What makes Rackspace so special? They tout it left and right on their site, and I didn't believe it until I ran into a problem I couldn't solve by Googling for a few hours. It was 5AM on a Thursday, I called the support number, and I waited a total of two rings. An American technician, answered the phone, sounding awake and ready-to-go. At this point, I'm already floored. A human answered my phone call at 5AM, a human that I can understand, none the less! Keep in mind, I have nothing against non-American techs, but sometimes you just can't get through the thick accent. Phone support should be local to the country you are supporting. Anyway, back to the story. So, I'm on the phone with this guy, for 4 minutes. That's it. Four minutes. I had Googled around for a few hours looking for the answer to a rather uncommon question, and the guy had it within 30 seconds. THAT is Fanatical Support. This guy was a pro, a completely rad dude. Not only did he know the answer right away, he walked me through each step of the configuration, making sure I had a good handle on the situation at hand. Click. That was the call. 4 minutes, and I was thrilled. I went right back to bashing away at my terminal, happy as a clam. I was so impressed, I sent a tweet off to @Rackspace to congratulate them on great service. A bit of time later, I got a response back, and a conversation ensued! 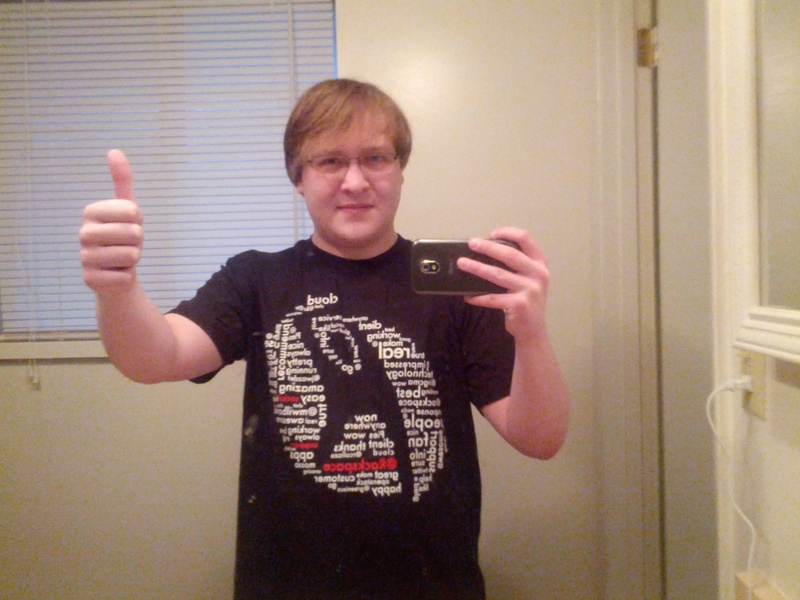 A few tweets and an email later, and I was being shipped a Rackspace T-Shirt. 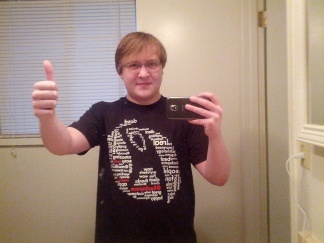 I did mention that I was going to write a blog post and post a picture of me in the T-Shirt. Rackspace, feel free to use this in any promotional material you want. I'm very happy with the service, tech, commitment to open-source, and price. Seriously, give these guys a try, I did and I'm never going back.